Home » Wordpress SEO » WordPress or Blogger: Which is Effective? WordPress or Blogger: Which is Effective? It is a community of bloggers using WordPress, Blogspot and other blogging platform. Here is the most discussing on which platform is good for blogging either it’s WordPress or Blogger, no one know correctly. As all of you know that few bloggers like BlogSpot because of less tech hassles and remaining bloggers like WordPress due to its features. When somebody ask me about blogging platform, which platform I should begin with, here is my answer. My suggestion is always goes to WordPress.com for a while, and once you get habituated with blogging, you should select a new blog on self-hosted WordPress platform. If anyone wants to use blogger.com then use it, as your Launchpad platform, but kindly don’t use rest of life. I could say that, because I started my blogging life with BlogSpot, and afterward shifted to WordPress.org. It was a hell lot of learning experience back then, but these days learning WordPress is quite simple through the help of videos. Anyways, in this article I will discuss a quick assessment of WordPress vs BlogSpot, and would likely explain under what condition which platform you should choose. WordPress Vs. Blogger: Which Blogging platform to prefer? Blogger or BlogSpot platform is very handy, whenever you just like to start a blog to share your thoughts. When you are not blogging for money, or you require a platform which doesn’t really need technical know-how, BlogSpot is really good. There are lots of restrictions of BlogSpot in terms of functionalists, SEO benefit, but overall if you just need a platform to start a blog with almost ZERO cost, BlogSpot is the right choice. At the same time, if you are blogging for money, publicity or for personalization yourself, BlogSpot is not the good choice. Reason being, you have limited control on appearance in search engines, and in due time, you are limited with adding new characteristics. I have read it often times, that Blogger is Google product, and it gives more SEO advantages, and it’s a pure rumour. It doesn’t matter if you utilize WordPress, Blogger, Drupal or any other platform; SEO is decided by how you configure your complete site for search engines. In Blogger platform, we have minimal control, and despite of the fact, they applied new SEO features, BlogSpot still is deficient in in SEO optimization. Conclusion, Blogger service is better than WordPress, when you will be creating a blog, for your passion, and you are fine with the minimal functions offered by Blogger platform. Tiptechnews utilizes BlogSpot as a blogging platform; however this will never produce my reasoning bias but WordPress gives you full control on your blog, and you could technically do anything you like. You receive complete control on the SEO, you host your personal files, you can add SEO plugins, which supports to make your web blog more SEO helpful. Moreover, you can always just add recent SEO techniques like start rating, Authorship without sweating. WordPress will let you do whatever you wanted, but at the same time you need to manage your own blog. You need to deploy WordPress on your server, and maintain your blog. It may sound technical, but with such an amazing support from WordPress community, you can always learn everything in no-time. Getting began with WordPress may require some effort, in terms of watching videos, learning how to add a plugin, getting use to dashboard, but is isn’t the same thing we learned on Blogger? If you are starting with blogging with mind-set to allow it to become well known, make money from it, you should always go with self-hosted WordPress blog. If you are a periodic writer, or a hobby-blogger, BlogSpot is the best pick for you. Matt Cutts, usually uses WordPress medium for his own blog, and he pointed out that Blogger is good for new users, and very simple to start out, and for casual blogging it’s fantastic. 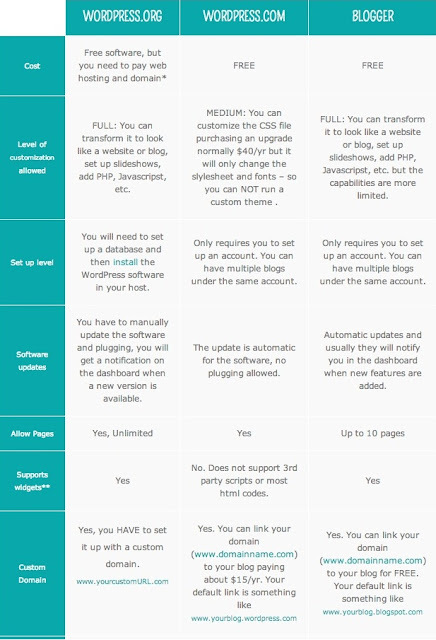 WordPress gives you more power, and you can customize it according to your need. Considering SEO convenience between Blogger or WordPress, both of them are nearly the same with default installation. WordPress default installation is not SEO friendly, but you can always make your WordPress blog SEO friendly, through the help of plugins available everywhere. Blogger platform is excellent when you are looking for a simple blog, and WordPress platform is amazing, when you are opting for professional blogging, creating a business blog, or planning to earn from your blog.